The flotsam and jetsam of 2016 are being dragged out to sea by the last ebb tide of the year. It is a strong night tide that has cleared the beach and leveled the sand, leaving it pristine, unmarred and untouched. It awaits the dawn of the next year and fresh footprints on a new stage. In the vast continuum of time, it is just another day. There are a trail of days, behind and before, that defy our reckoning. But we have drawn a line in the sand with our calendar and tomorrow we will mark the start of a new year. It is a time, real and imagined, of new hope and new beginnings. It is a time of resolutions. I am what they refer to as, of a certain age. Though the definition is vague, it is generally accepted to mean, no longer young. The sun has already dropped below the horizon and the moon is just a sliver in the night sky. 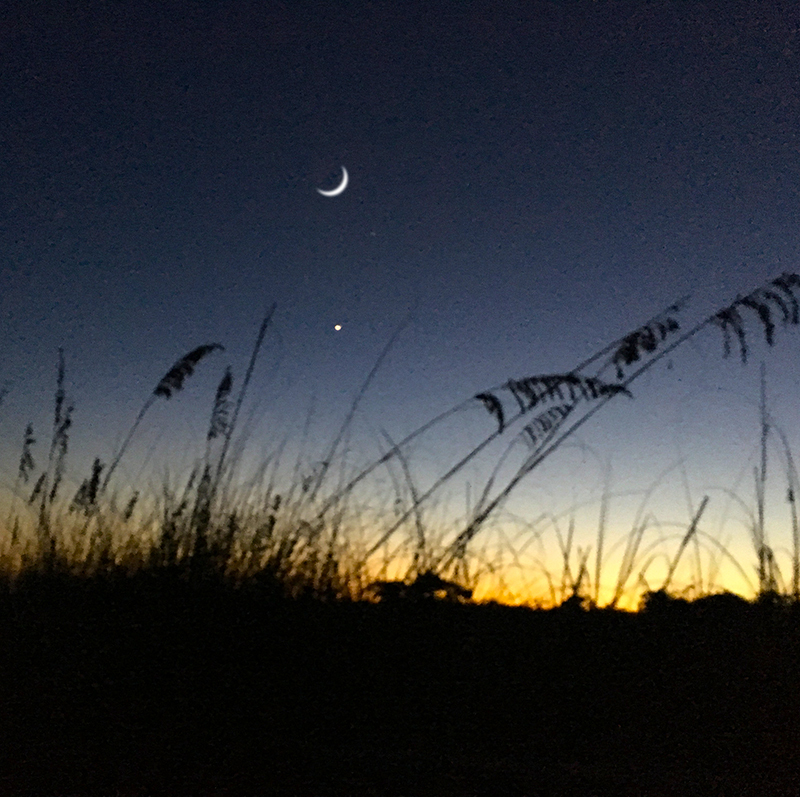 Venus shines brightly directly below the waxing crescent, as if suspended by an invisible thread attached to the arc of its celestial neighbor. 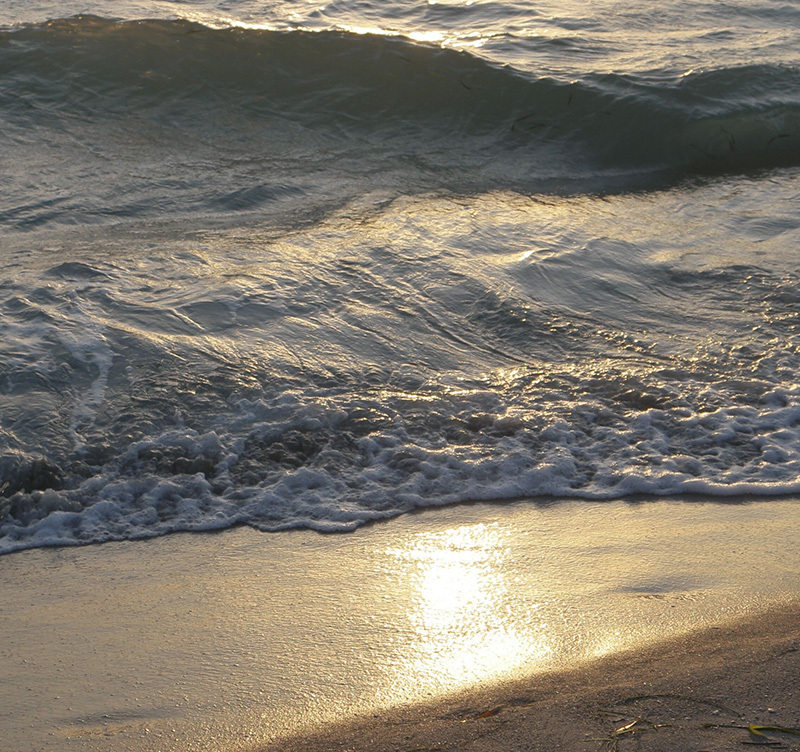 With the help of some nocturnal insects, the gentle surf from the Gulf of Mexico provides the soundtrack for the evening. The reverie is interrupted only briefly by the sound of a distant power boat returning to the marina, its pursuit of fish done for the day. On plane, the drone of the outboard engine is joined by the slap of its hull as it pounds against the offshore chop. I’m writing this from my version of paradise … the lanai of a condo rented on Sanibel Island. Sanibel has no high-rises, no traffic lights, no fast food restaurants, the only exceptions being a Subway and Dairy Queen, grandfathered in after the strict building ordinances passed in 1974. It is as peaceful as it gets in this crazy state of Florida. At the time, I didn’t know his name. All I knew was that I was in a hurry and he was partially blocking the entrance to the Shop N Save. He looked to be about 14 or 15 years old. The August heat radiating off the pavement, caused a thin sheen of perspiration to coat his ebony skin, soaking into his jeans and dark grey sleeveless t-shirt. “Excuse me,” he said, holding up his hand motioning for me to stop. Here it comes, I thought, He’s going to ask me for some type of handout. He didn’t disappoint. His approach was direct and to the point. I’m pretty sure there is an invisible sign floating over my head that only people who are panhandling can see. It says, “Soft Touch” or “Easy Mark”, or something to that effect, with an arrow pointing down at my head. He paused for just a second then said, “Could you give me a ride then? It’s just down the street,” as he pointed in a southerly direction. “What’s just down the street?” I asked, somewhat incredulous at his bold approach. Between my less than stellar hearing, the ambient street noise, and his thick inner-city dialogue he mumbled something that I didn’t quite catch. “I’m sorry, what’s just down the street?” I repeated. Still not understanding everything he was saying, I said, “I’m going to get my groceries,” and walked past him into the store. I had less than a dozen items to pick up but that still gave me plenty of time for an internal debate. It’s not my problem … he’s young, it won’t kill him to walk a few miles … but it’s 95° …what if he tries to carjack me? … he’s a skinny kid, I could take him … but what if he has a gun? … he’s only 14 or 15 … even 14 year olds have guns these days … if he was intent on carjacking someone, would he hang out in such a visible spot? …it’s just not smart to let a total stranger in the car with you … but he seems so desperate … I could go out the other entrance to the store and circle around to my car, he would never see me …it’s not my problem … I can spare 10 or 15 minutes out of my life to help someone . I paid for my groceries. Not bothering to take a shopping cart, I balanced my two small bags of groceries in each hand, and headed out of the store. He was sitting on the ground, back pressed against one of the brick columns that ran the length of the store. His arms wrapped around his bent legs, forehead resting on his knees, he was the picture of dejection. I shifted the bags in my right hand to my left and introduced myself. Tentatively he took my offered hand, “Maurice,” he replied. I loaded the groceries into the back of the SUV while he climbed into the passenger seat. Opening the driver’s side door, I took one last inventory of my companion before settling in behind the wheel. “So, Maurice, where are we headed?” I asked, still not understanding exactly where he wanted to go. “I’ll show you, it’s not that far,” he said trying to reassure me. “The people from the store let me hang out, I tried to earn some money by helping people with their groceries, but nobody wanted any help,” he volunteered. “If you live in the city, how did you end up out here?” I asked. “I was supposed to meet my cousin, but I took the wrong bus. Now I don’t have any money, I’ve got to get home … this is the worst day of my life!” he blurted out. I couldn’t help but laugh. “Maurice, I really hope this is the worst day of your life, but if you live very long I can pretty much guarantee this won’t be the worst day of your life.” Before my eyes the young black man I had viewed as a potential threat morphed into a kid … lost, confused and just trying to get home. “How much is the bus fare?” I asked. Good luck with that, I thought to myself. “Can we look?” he said excitedly. I pulled off the road and started rummaging through the cup holders and console. The drink holders yielded 79¢, the console revealed a long forgotten crumbled one-dollar bill along with some more change. I passed the loot over to Maurice bit-by-bit as he totaled it up. “How are we doing?” I asked. “We’ve got it!” he exclaimed. With his head held high and a bit of strut in his walk he made a beeline for the bus. I’ve thought about Maurice several times since then. He told me what school he would be attending this fall, I have a pretty good idea what part of town he lives in … the odds are not in his favor. I’ve lived in two houses built in 1890. I’ve learned to fix a lot of things. But the things I can fix pale in comparison to the things I can’t. I can’t fix racial strife and inequality. I can’t fix abusive cops. I can’t fix the divisiveness of Black Lives Matter. I can’t fix either of the Presidential candidates or even top 40 country music, and that’s just scratching the surface! So why even worry about it? I’ve flirted with Apathy. I’ve considered going steady with her. If I totally committed to her and embraced her, maybe life would be simpler … I wouldn’t have to worry about all those things I can’t fix. But Apathy will never be my mistress, you see I have skin in the game. My grandson, whom I love more than life itself, is biracial. I see him as an amazing young man bursting with undeveloped potential. Society will see him as a black man. Already tall, when he reaches the age of Maurice, he will probably tower over me. Five years from now, will he engender fear when he approaches a sixty-something white man? Will he receive extra scrutiny when he walks into an upscale store? Will he be viewed as an automatic suspect by police? I don’t like the term white privilege, I find it simplistic and divisive. Privilege exists on an almost unlimited number of levels that are beyond our control or influence. If you are born into money, you will have advantages that others don’t. If you are born with perfectly symmetrical and proportioned features that fit our definition of beauty, you will have advantages that others don’t. The majority of CEO’s are male, over six feet tall and have full heads of hair. Life is not, or ever will be, a level playing field. 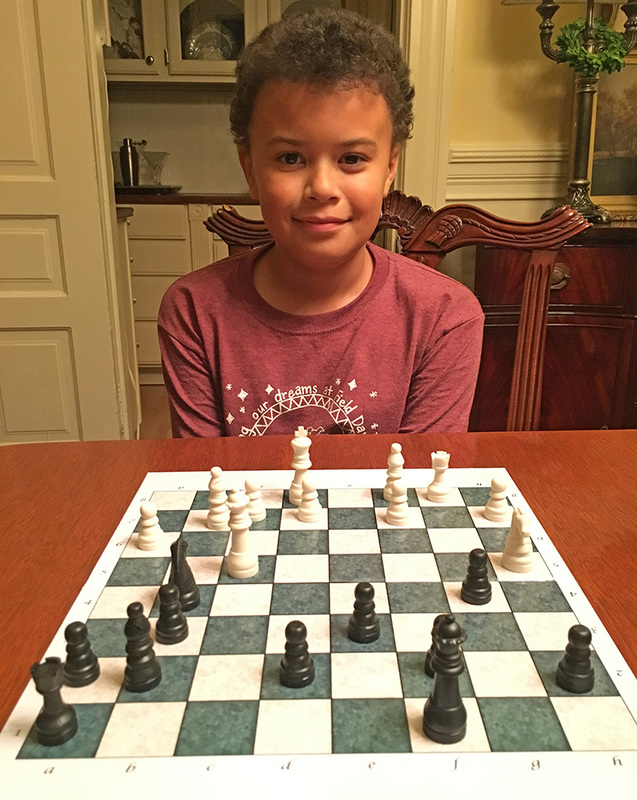 While I may not like the term, white privilege, it would be naive not to recognize that my grandson will face challenges that I never had to face. Only by recognizing and acknowledging these challenges will we ever reduce or eliminate them. However, having challenges that I have not had, does not make him a victim. Not being born beautiful, rich, or having any of those other advantages does not make you a victim. So where do we go from here as a society on the myriad of racial issues that face us as a species? It would be the height of hubris for me to pretend I have the answers to those questions, but I can tell you how I would like my grandson treated (and by extension the Maurice’s of the world). I want him seen as an individual, not as a member of some monolithic block. 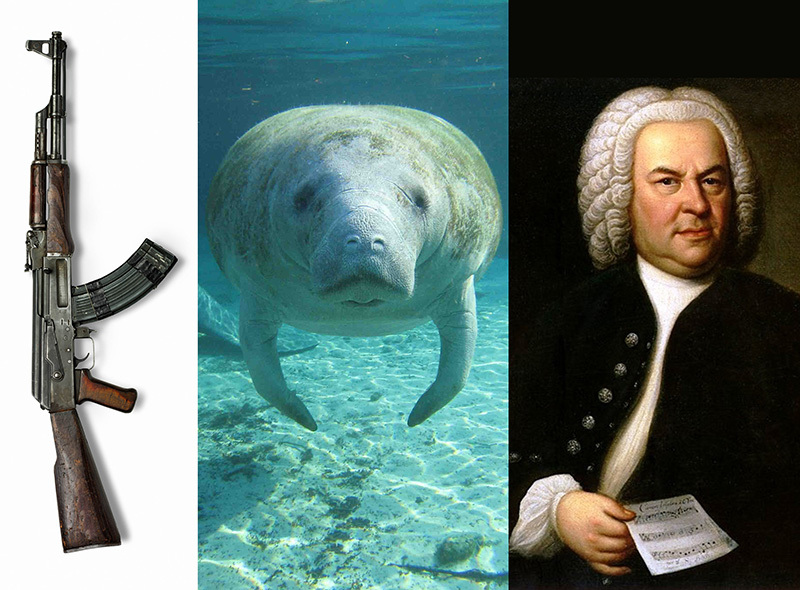 As an individual he will decide what types of food and music he will enjoy. As a unique person he will decide who to vote for. As an individual he will choose his friends, his educational path and ultimately his profession. I never want him instantly categorized on any level based on his appearance. I want him held accountable for his actions. I want him judged but not prejudged. I want him given a fair chance, but not receive special consideration based on his skin color. I don’t want him awarded a ribbon for just showing up. A couple of years ago, I taught him to play chess. He has yet to beat me in a game of chess. One day he will best me, and on that day he will know he has earned that victory. What do I want from my grandson? I am the only Yankee in our family, to be more precise, I’m the only non-Texan. I’m not exactly sure where Texans fit into the whole North-South thing. It’s been my experience that they view themselves as a breed apart from the rest of the world. 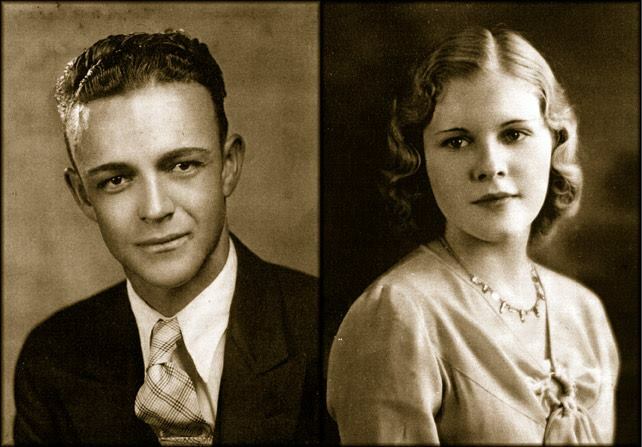 In any case, I’m the last and late born son of Ray and Lillie Bell. Last may not be the best way to describe my position in the family, as it implies a string of many children. In fact there were only two sons born to this union. What is unique is that our births were almost two decades apart. In November of 1953 my parents moved from Sherman, Texas with a population of just over 20,00 to Saint Louis with a population of 850,000. The culture shock of moving from a sleepy little southern town to a large industrial Midwest City was exceeded only by the shock of my unexpected arrival. Nineteen years after the birth of my only brother I arrived on the scene in August of 1954. My mother had given up a little white frame house with a rose garden and goldfish pond to live in a two family flat in south St. Louis. When you combine that transition with a record-setting heat wave, an unexpected pregnancy and general culture shock from moving to a different part of the country, you can understand why my mother considered herself trapped in a special type of Midwest, urban purgatory, if not hell. Christmas holidays provided the perfect excuse to make at least a brief escape. The yearly pilgrimages back to the promised land of Texas became a tradition. The perfect excuse to visit with both sides of the family. The perfect excuse to enjoy multiple holiday meals. And the perfect excuse to drink iced tea the way it was meant to be enjoyed … sweet. Most of my childhood Christmas memories revolve around those annual trips to Texas, riding in the back seat of my father’s big Pontiac. While not exactly traditional, those Christmas memories were as magical as anything that Norman Rockwell could conceive. Pontiacs were my dad’s choice of vehicle when I was growing up. In Dad’s opinion the quality of a car was in direct proportion to the amount of cubic feet available as trunk space. The big four door Pontiac Catalinas provided a lot of cargo carrying capability for the money. He eschewed Pontiac’s Bonneville model as too expensive. It’s luxury features were merely opportunities for more things to malfunction or break; most importantly the extra money spent on the upscale model did not gain you any more trunk space. Our luggage along with the piles of presents for assorted relations tested the capacity of those land leviathans. It may have been crowded, but it was a cozy crowded. What kid would not want to be surrounded by wrapped Christmas presents? The knowledge that a good number of those packages had my name written on the tag only added to the excitement. Johnny Mathis, Brenda Lee, Ella Fitzgerald, Gene Autry, Andy Williams and most importantly David Seville and the Chipmunks serenaded our family with holiday songs as we speed south. The signal from the AM radio drifted in and out as we entered then excited the range of the stations in the nearby towns along our route. A good portion of the first leg of our journey was spent on the Will Rogers Turnpike. 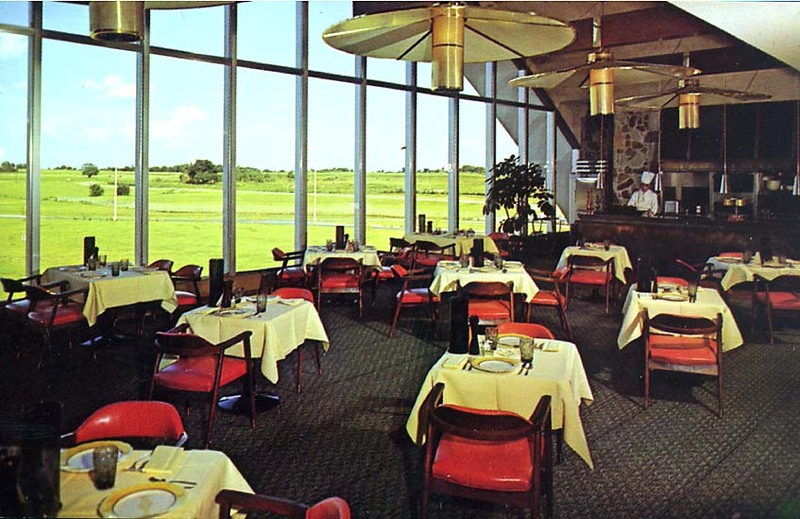 Named after Oklahoma’s favorite son, its main claim to fame in my mind was not the divided four lanes or the reasonable tolls, but the “Glass House Restaurant” that spanned the turnpike in Vinita, Oklahoma. Built in 1957 by the Conoco Oil Company, the same year the turnpike was opened, it afforded drivers going either direction an opportunity to fill up on gasoline, souvenirs and pot roast. It was the first restaurant constructed over a United States public highway and became so popular with the local residents that high school proms from nearby towns were held there. 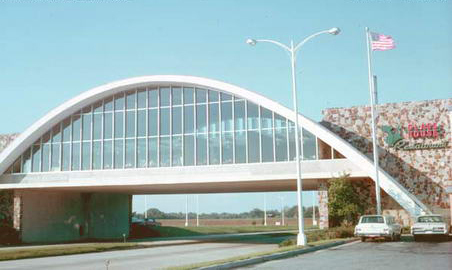 Later it operated as a Howard Johnson’s then became a McDonald’s and it’s elegant mid-century modern arches were painted a golden yellow. I chose to view this (in my current curmudgeon state) as a metaphor for the general decline in charm, civility and good taste in America, but that’s a blog post for another day. We left the turnpike at the Big Cabin exit and headed south on highway 69. As seat-belts were not standard equipment back in the day and certainly not in the rear seats, I spent much of my journey in the back of the car standing on the drive-train hump with my elbows hooked over the vinyl clad front bench seat. If that wasn’t enough to give Ralph Nader nightmares, I also spent time reclined on the large deck beneath the rear window, totally unencumbered by any type of restraining device or car seat. 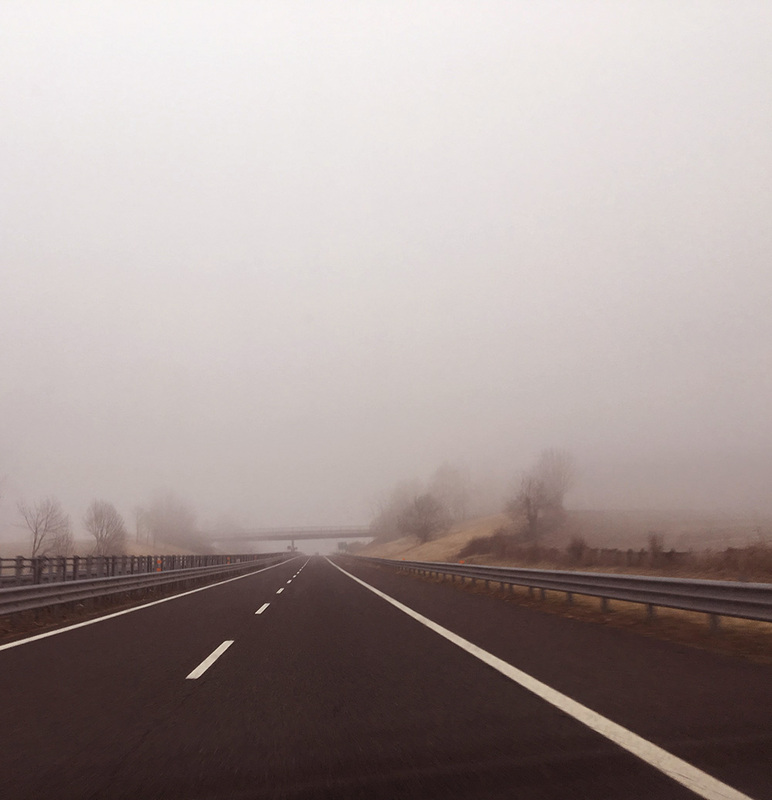 Some of my favorite memories of those trips whether we were headed to Sherman, Chandler, or Wichita Falls Texas was not the time spent on the turnpike, but the two lane roads that took us through the little towns along the way. The local business districts, pre-Walmart, were decorated for the holidays in the best early 1960’s kitsch … Christmas themed display windows, banners stretched across Main Street that proclaimed, “Merry Christmas.” Courthouses and town squares where nativity displays were the norm and where figures of Santa, Rudolph and Frosty coexisted with the holy family and somehow all made sense. Of course the real joy was reuniting with family. The Agnew’s, the Boatman’s and the Feltman’s. The hugs, the laughs, the meals; piles of turkey and ham, dressing and bean beans, mounds of mashed potatoes, sweet potatoes and of course gallons of sweet tea. Bowls filled with hard ribbon candy that apparently every home was required to have (though I never recall anyone actually eating any). Then the finale, the passing of presents and the flurry of holiday wrapping paper flying through the air as presents were revealed. Dad went to his reward in 2012. Mom, earlier this year, she would have been 103 this Christmas day. It is just my brother and myself from that original little family unit.. Neither my children nor grandchildren will ever ride in the backseat of a 1963 Pontiac loaded down with Christmas presents, headed to Texas. But I will do my best to pass down the magic. And if the opportunity presents itself, we will stop and have lunch at the McDonald’s that spans the Will Rogers turnpike.